We are a unique entity in this industry, actively committed towards manufacturing a premium quality range of Organic Plant Protector. The constant growth of the world's population requires substantial resources for the production of food. Post-harvest activities have an important role to play in achieving this objective. We are engaged in providing Manure Sprays to kill fly larvae which develops in treated areas. This process is used in areas where manure fails to be removed in a 7 to 10 days schedule. Our services are performed by expert professionals using latest techniques. 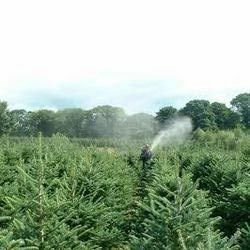 We care for the plants up to the maximum extent we can with the best and fast relieving pesticides and chemicals which does not let your garden feel unhealthy. We suggest the best, latest and proper chemicals and pesticides for all kind of pests. We are offering effective Land Scape/Garden Treatment Services by making use of advanced techniques and tested fertilizers and manures. This helps us in eliminating pests from garden and landscapes as they can affect the plants, trees and grass. Moreover, our experts make sure that proper care is taken and our treatment does not harm these plants. Uses Control of a wide spectrum of insect pests, e. G. Aphids, Colorado beetles, thrips, Lepidoptera larvae, Coleoptera larvae and adults, etc., in cereals, hops, ornamentals, potatoes, vegetables, cotton, and other crops. Provides good control of insect-borne plant viruses. Nimbus Harbor Facilities Management Pvt. Ltd.
We are proficient providers of premium quality Garden Material. The expansive range of garden material offered by includes soil, fertilizers and pest controls. We provide solutions for different planting needs such as container plants, garden plants and outdoor/indoor needs. At Wasp Nest Removal Chennai we have same day appointments and there are No Call-Out Charges. We offer our clients excellent General Pest Control service. Control against Ants, Cockroaches, Mosquitoes, Earwings, Files, Fleas, Mites, Spiders, Bed Bugs, Wood Borers, Lizards, etc.